pfft, real men don’t need Q bank either. Amateur. Real men will pass just by skimming through the secret sauce the day before the exam. I seriously raised eyebrows at this post, but I suppose they must exist. I think doing questions certainly helps you “apply” the LOSs and retain info, but I would strongly advise against *only* using Qbank to prepare. However, I’m sure you’re right and there are some folks who have done just that on these boards. Any of you brave souls want to speak up? If you did this, tell us what you thought of the exam. Also curious to hear if you did a mock or two how you scored, and if this was your Level I strategy. > suppose they must exist. > did this, tell us what you thought of the exam. > you scored, and if this was your Level I strategy. I only used Qbank. For level one I only used Qbank. I passed L1 with two sections below 70 last December. To answer your question, I thought the exam was difficult but I finished each section at about the 2 hr point. I took three mock exams at different points in my preparation and scored 70, 78, and 92. Every single time I used Qbank it was in a timed, exam-like environment. I would create a 60 question test, sometimes from all sections (besides ethics) and toward the end a lot were just from FSA or Equity. I found a lot of value in continuing to do the questions after the first 1000. At that point my Qbank scores were about 70 percent or so, and I would still encounter new material every so often. By the time I finished 2500 questions (this was about as many as I did) I was still only scoring in the 80s. But once I had a section above 70-80 percent pretty solid I wouldn’t go back. My favorite part was that I would print out the 100 or so problems that I thought would be most helpful to master. So I had a collection of difficult problems and this was helpful in final review. I have taken a lot of tests and my philosophy is that optimal preparation consists of engaging in the activity that is tested. In this case, that activity is answering 60 questions in a timed session. So why waste time doing anything else? I was short on time since I began at the beginning of May and had work/family commitments. That’s my approach, come late Aug we’ll see if it has merit for me. I am a repeater. I only read the new chapter (Private Co Valuation) and new LOSs and did so directly from CFAI books. Starting at the end of Jan. I used Qbank, EOC Schweser and the Schweser weekly online class. I used about 1,800 Qbank questions to make sure I had concepts from last year and ended up with 83%. I also did the EOC Schweser questions at the during the week and I would reference CFAI books when I had a question on something. My take on Qbank is it can be helpful on a week by week case because it can identify weak areas and give you the opportunity to work more problems in your week areas. But I really wonder if there is any real benefit gained by going through all 4,000+ questions. The month of May for me was Windsor, CFAI EOC, 5 Schweser mocks and the CFAI mock. > session. So why waste time doing anything else? Hawg, I cut some of your post, but I liked your response. 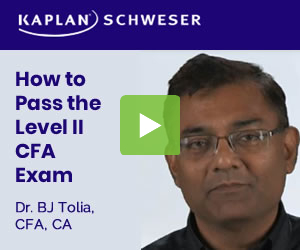 For all my Series exams, I followed your strategy of only doing questions, but since I’ve started the CFA curriculum, I do actually read the material [or at least, I read Schweser]. I think it’s because I simply don’t have the cajones to ignore the books and follow my old (albeit successful) method, which is basically what you’ve listed. -The Qbank can only contain so many questions. I know that for me, me memory is surprisingly good. If I’ve seen a question before, I’ll start to go for the answer and not even be sure why, just because my brain seems to remember “Oh yeah, this one is ‘temporal method’. -The Qbank will contain questions that Schweser has written - doing 4,000 of them will get me VERY accustomed to their style of questions. Come exam day, I don’t want to get system shock when I see some of the weird stuff CFAI comes up with. All in all, I think your method is probably more efficient than mine. But as I’ve remarked before, I’m not looking for necessarily the “most efficient” method of passing - merely the surest. For me, that was spending countless hours with the curriculum until I thought I knew it. Great insight SSF, hope August brings glad tidings. I’m the only one who only used Qbank? Everyone else did readings from CFAI or Schweser, etc? kinda surprised. I just kept doing the CFAI end of questions. It’s amazing how many times u can keep getting the same questions wrong lol.